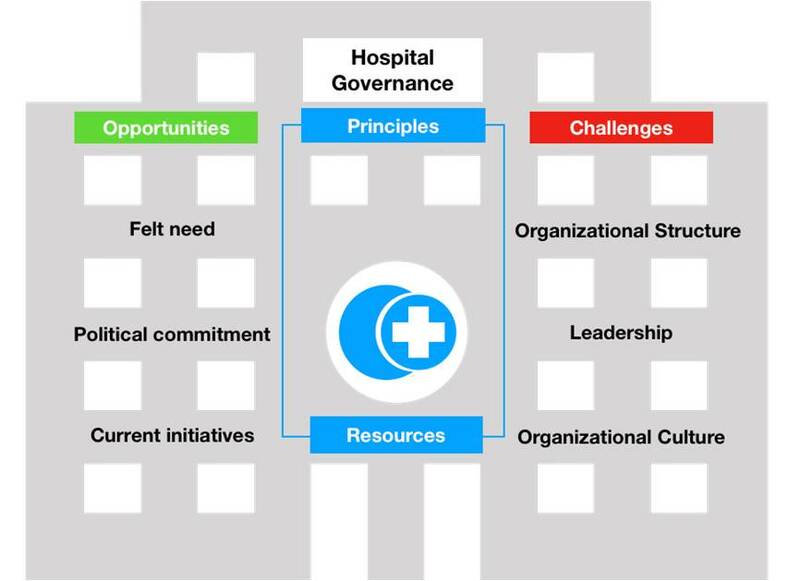 Hospital Governance can be defined as a framework for collective decision making that ensures the appropriate use of hospital resources to achieve its mission and its sustainability through policy formulation and oversight. The recognition that the health sector requires major change in order to meet public needs and the political commitment to implement universal health insurance presents a unique opportunity to implement good governance within the healthcare sector. This will also help ensure the success and sustainability of the new healthcare system. Facing these opportunities are three major challenges that should be overcome. First the development of organizational structures that can support the application governance within our hospitals. Hospitals today require leaderships that are capable of creating shared vision and embracing collective decision making supported within an organizational culture that is characterized by consistency, involvement, and adaptation to community needs. At the center of it all lies the principles of good governance (rule of law, responsiveness, participation, consensus, transparency, accountability, equity and inclusiveness, effectiveness and efficiency) and the degree to which the human resources available understand them and the manner in which they will apply them at all levels of decision making. Based on Hospital Governance Workshop, HGU, MRI, AU. December 20, 2018. Copyright © 2014 Researches Center. All rights reserved.